Notte Bianca will return to Valletta in spectacular fashion on Saturday the 7th October 2017. Notte Bianca will return to Valletta in spectacular fashion on Saturday the 7th of October with a carefully curated programme put together by the Notte Bianca team together with the Arts Council Malta, which draws from all the myriad facets of the creative sphere. Festivalgoers can expect to experience amongst the very best in music, dance, theatre, visual arts, literary events, as well as a continuation and expansion on last year’s shift into the exciting emerging world of new and digital arts. Notte Bianca will also continue to use Valletta’s streets and public spaces in innovative, creative ways thanks to a mix of roaming and site-specific projects. As such, a number of international guests have been invited to participate in this year’s festival. 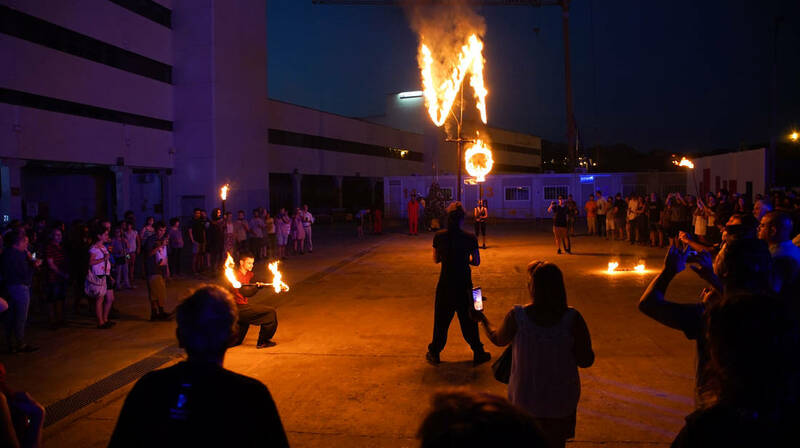 During the week leading up to Notte Bianca, world-renowned theatrical group La Fura dels Baus will host a workshop for local artists and theatre practitioners to immerse themselves in the creative ethos of this acclaimed troupe. Through this intensive workshop, they will develop a unique performance piece that will be open to the public on the night of Notte Bianca. The public are invited to download an app to experience the performance, which will be open to 500 people each time. More information in the coming days. A diverse assortment of multi-national electronic artists – including ODED NIR, Above Smoke and The Floating Fluxman – will combine talents in NOTTE BLANK. This extraordinary entertainment event will include musical and visual performances designed especially for the festival. Local artists will have the opportunity to connect and collaborate with these international guests and find ways to fuse their talents into a thrilling live production which is meant to attract new audiences at Fort St Elmo’s ravishing Pjazza D’Armi. On a similar style, the duo from SPOTS & STRIPES will be doing it differently at Disco Boċċi where audience members and boċċi players will enjoy playing with glowing boċċi to a soundtrack of disco music. Fans of Maltese music can enjoy IL-KBIR GĦADU DJ by the team behind KELMA KELMA NOTA NOTA who will present a set of Maltese Music remixed by local DJ’s. Visitors wandering into Republic Square can join in a spot of birdwatching in AJRU, an interactive installation of several bird-like objects banding together in flight. The installation developed by the Interactive Architecture Lab is inspired by the thousands of people who flock to Valletta’s ports every year. Jazz enthusiasts will delight in a special treat as acclaimed British drummer Clark Tracy (UK Jazz Drummer 2017) will be joining local virtuosos Dominic Galea and band in Sur Jazz. Together with famed local vocalist Nadine Axisa, the band will play a selection of jazz favourites on Victoria Gate. Their performance will also include a special tribute to the late Maltese music legend Sammy Bartolo with special jazz arrangements of his greatest hits. And in line with Notte Bianca’s tradition to celebrate international artists, this year a special concert titled Claire Tonna Tkanta Leonard Cohen will see local songstress Claire Tonna and band celebrate the life and works of the late Canadian singer-songwriter Leonard Cohen, whilst renowned pianist Gabi Sultana will be celebrating the works of Philip Glass. A number of other established creatives and organisations will be participating this year including artists from the rubberbodies collective, Inizjamed, Moveo Dance Company, Duo Kukkanja, George Curmi Il-Pusè, Late Interactive, Ġiżimina and many more. Notte Bianca will also feature the traditional fringe programme – Notte Bianca Atmosfera. Venues, shops and spaces all around Valletta will be open till late and organising their own events. This year the Archbishops’ Palace will be open for the first time, whilst the Malta 5D experience will be open to audiences for free! For more information on all Notte Bianca events, including the ancillary Atmosfera programme, please visit www.nottebianca.org.mt. In the meantime, Malta’s capital city is once again all set to stage another arts and culture extravaganza. Notte Bianca is organised by the Festivals Directorate within Arts Council Malta under the Ministry for Justice, Culture and Local Government, with the support of Valletta 2018 Foundation, Valletta Local Council, MSV Life and Farsons.